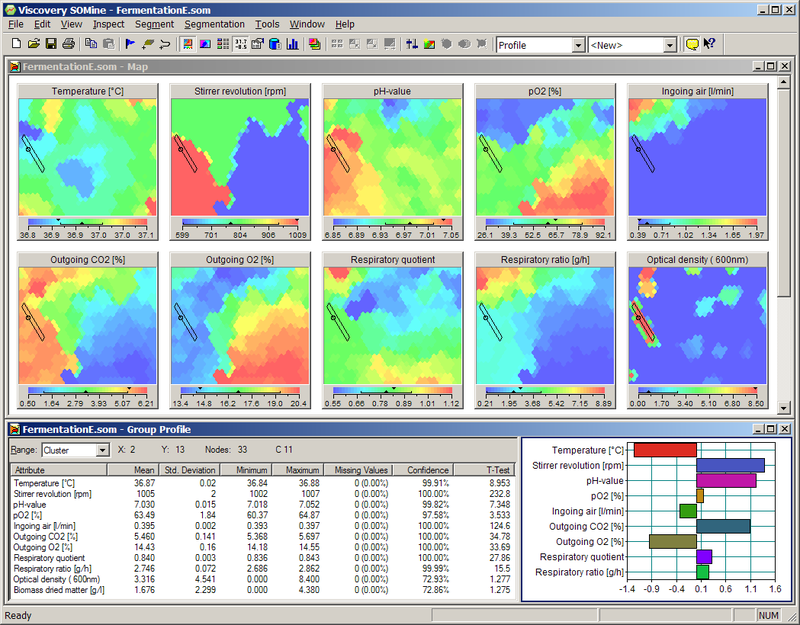 Viscovery SOMine® is a desktop application for explorative data mining, visual cluster analysis, statistical profiling, segmentation and classification based on self-organizing maps (SOMs) and classical statistics in an intuitive workflow environment. Viscovery SOMine combines classical statistical methods and SOMs in a system for explorative data mining and predictive modeling. The robust, high-performance SOM technology is used for representing and visualizing data distributions that may contain thousands of variables (e.g., in text mining applications) and millions of data sets. In contrast to traditional data mining systems, Viscovery provides an intuitive approach to data, so that even users who do not have advanced statistical knowledge can easily understand and use the analytical models. Viscovery thus embodies a unique visual approach to data which facilitates understanding and communication of analytical models. All tasks, including importing the data, pre-processing and treatment of outliers, and defining segments and measures, are guided by workflows. Completed models can be modified and applied again to new projects. Viscovery SOMine provides easy-to-use tools for data exploration, identification of dependences, visual cluster analysis, segmentation and classification, as well as a number of classical statistical functions, such as descriptive statistics, group profiles, correlation analysis, PCA, histograms, scatter plots, and others. The visual interface allows direct, context-sensitive access to the original data records underlying the maps and their complete statistics at any point in the analytical workflow (Expert and Enterprise editions). SOMine is an affordable solution for explorative data mining, cluster analysis and classification. It is an alternative to the enterprise solution Viscovery Profiler which has the additional capabilities of providing database interfaces and the capabilities to automate model creation and application and to integrate models in real-time environments. Viscovery SOMine is offered with competitive pricing and a range of licensing options to help consultants, analysts and small enterprises to easily integrate our products into their business and research projects. For institutional researchers, SOMine provides a scalable data analysis workbench that offers the flexibility and extensibility needed to access, analyze, visualize and report discoveries to colleagues and the broader academic and research communities. For academic users, we offer heavily discounted pricing and licensing options for those starting their careers. For the convenience of SPSS users who want to extend their available functionality with SOMine, Viscovery also provides a special version of SOMine at a reduced price. While its analytical capabilities are identical with the corresponding SOMine editions, the SPSS version is designed to work closely with the SPSS environment and uses SPSS data files (*.sav).